The son of a Southern pastor is sent to conversion therapy when he tells his parents he is attracted to men. 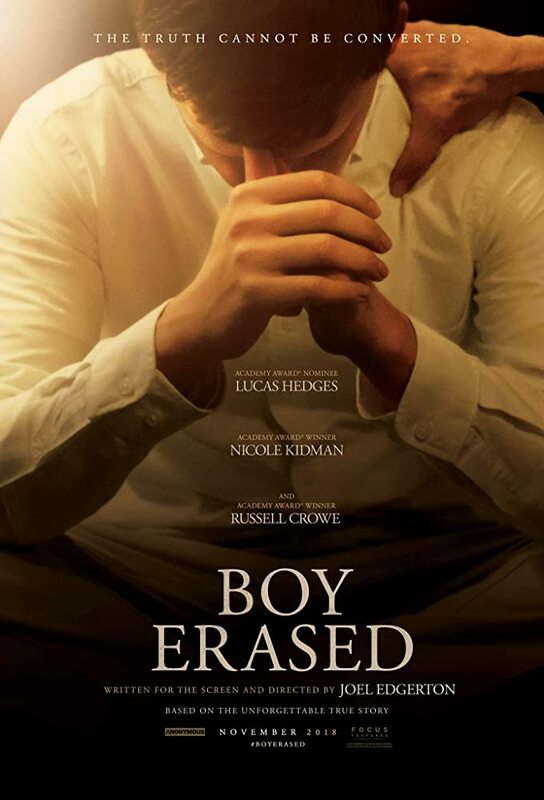 Watching movies like "Boy Erased" always make us angry, not because of the story that's being told, but because we know that there are still people out there who think conversion therapy works and think that being gay is a choice. "Boy Erased" is the second feature film directed by Joel Edgerton. His first film "The Gift" was a pleasant surprise and proved Edgerton could direct as well as act. This film is also written by Edgerton and has been adapted from the true-life memoirs of Garrard Conley from his own experiences in conversion therapy. The film tells the story of Jared Eamons (Lucas Hedges), who is based on the previously mentioned Conley. At the age of 19 as a young man in college, Jared gets outed to his parents by another student. When Jared's father Marshall (Russell Crowe), a Baptist minister, discovers Jared's sexual orientation, under the guidance of the elders from their church, Marshall is told and believes that the best course of action is to send his son to a conversion therapy center called The Source. Jared's mother Nancy (Nicole Kidman) thinks her husband and the church know what's best, so she blindly agrees with trying to subject their son to the abuses of conversion therapy. Of course, they don't know what they are doing is abuse. They believe they are doing is what will be most helpful to Jared, but as time passes, it becomes more and more clear that conversion therapy doesn't work and only serves to damage their son in more ways than anyone imagined. "Boy Erased" is the second film this year to attempt to tackle the subject of conversion therapy, the first being "The Miseducation of Cameron Post" directed by Desiree Akhavan. Both tackle the subject in their own manner, and both are effective and powerful in their own way. It is excellent to see these films exposing the abuses that go on in places run by people who don't have a clue what they are doing. It is infuriating to think there are some people, including high-ranking government officials in the current administration, who believe this damaging therapy actually works. They refuse to see it for what it is: abuse. It's plain and simple abuse. Director Joel Edgerton does a great job bringing Garrard Conley's story to the big screen in a truthful manner. The story offers many emotional moments, but much of our intense outpouring during the film stems from the subject matter itself more than anything that occurs within this specific narrative. Don't get us wrong, it's a story that must be heard, but for us, watching projects about this subject matter reinforces how passionately we feel about advocating for equal rights. The most successful moments in this movie involve several touching interactions between Lucas Hedges and Nicole Kidman, as well as some later confrontations between Hedges and Crowe. It's almost a guarantee that you will get choked up during the middle and the end of the film like we did. Lucas Hedges continues to show that he has talent beyond his years, and we have a hunch he will continue to impress us long into the future. Both Kidman and Crowe are magnificent in their supporting roles, and each of them gets a chance to shine despite not having large amounts of screentime. Joel Edgerton has long shown he is a wonderful actor, but he continues to prove he is also a capable writer and director as well. We can't wait to see his next project. "Boy Erased" may not be the big Oscars/awards contender many were hoping for (outside of a couple of darkhorse nominations for acting), but this film is absolutely still worth watching and worth supporting.